Fig. 3. 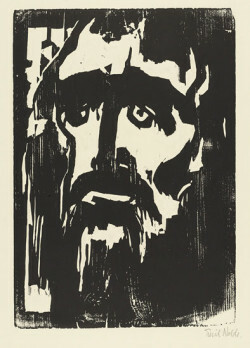 Emil Nolde, Prophet (1912), woodcut, composition 32.1 x 22.2 cm. The Museum of Modern Art, New York, given anonymously (by exchange), 1956, ©Nolde Stiftung, Seebüll, Germany. “German Expressionism: The Graphic Impulse” is a showcase for The Museum of Modern Art’s extensive collection of German graphic art from the first decades of the 20th century. 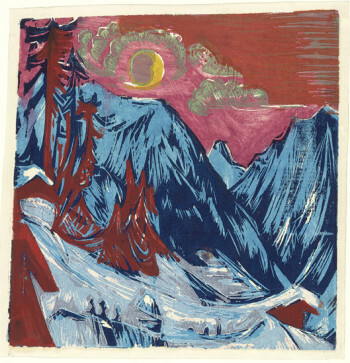 Containing some 250 works by more than 50 artists, it is exhaustive and ambitious, balancing iconic woodcuts with intaglio prints, drawings, posters, paintings, illustrated books and magazines; augmenting the familiar jagged distortions of die Brücke’s brand of Expressionism with the gentler utopias of the Blaue Reiter group and the bitter postwar “realism” of Neue Sachlichkeit. This is a show rooted in German history, and before stepping into its galleries, it is worth recalling where Germany was at the beginning of the 20th century. Thirty years earlier it was not yet a nation (the Prussian component of what would become Germany was described by Friedrich Freiherr von Schrötte as not a “country with an army, but an army with a country”). United by Otto von Bismarck and led by the repulsive Hohenzollern family through a series of calculated wars against its neighbors, Germany entered the new century as a very punchy and insecure empire. Between 1904 and 1907, as Ernst Kirchner—whose works dominate the first gallery—was seeking inspiration in the African art of Dresden’s ethnological museum, imperial Germany was initiating the century’s first genocide, decimating the Herero in South-West Africa. A decade later, it was at the center of the war that was supposed to end all wars. Fig. 1. 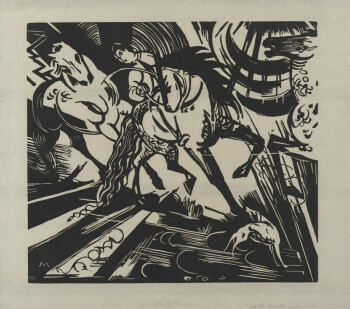 Franz Marc, Reitschule nach Ridinger (Riding School After Ridinger) (1913), woodcut, composition 26.9 x 29.8 cm. The Museum of Modern Art, New York, gift of Abby Aldrich Rockefeller, 1940. The works on view in “The Graphic Impulse” make clear that Lukacs’ remark was certainly badly reductive and perhaps even a bit of a libel. Die Brücke, the group started in 1905 by the Dresden architecture students Fritz Bleyl, Erich Heckel, Ernst Ludwig Kirchner and Karl Schmidt-Rottluf, which essentially kicked-off Expressionism in the visual arts, shared in some Wagnerian atavism, but did not fit the mold of regressive, myth-worshipping Germanic cults. Although the group would later be an amenable enough home for a wannabe-Nazi like Emil Nolde, there is no creepy chauvinism in Heckel’s frisky dancers or Pechstein’s naked picnickers. The desperate search for “totality” that characterized Germany’s 19th-century cultural politics (and laid the foundation for the nightmare of the 20th) is barely detectable here. The city in Kirchner’s street scenes isn’t portrayed so much as corrupt and degenerate (as George Grosz and the Weimar artists of the 20s would come to find it) as exciting. And the formal constraints imposed by woodblock prevent die Brücke depictions of countryside frolics from slipping into sentimental soft-focus. There is an incipient—even adolescent—quality to these works, a release of creative and sexual ardor, and (some brooding Teutonic intensity notwithstanding) a celebration of emotional sincerity, directness, and authenticity. This work may not be impulsive, but it is defiantly graphic. This is a vision of the world defined by line and edge. MoMA has been working to make its exhibitions more interdepartmental [see the Art in Print interview with Deborah Wye] and “The Graphic Impulse” includes a number of paintings. These provide context, but (Kandinsky excluded) they look rather weak compared to the prints. It is customary to think of prints as a kind of accessory to the more serious business of painting, but in some eras, the situation is reversed. This is one of them. Fig. 2. Ernst Ludwig Kirchner, Wintermondnacht (Winter Moonlit Night) (1919), woodcut, composition 30.5 x 29.5 cm. The Museum of Modern Art, New York, purchase 1949, ©Ingeborg and Dr. Wolfgang Henze-Ketterer, Wichtrach, Bern. The hardening and sharpening of the Expressionist aesthetic that took place in the second decade of the century was driven almost by “rationalization” to use the German sociologist Max Weber’s term: in order to satisfy growing commercial demand, the movement was increasingly organized by a bureaucratic apparatus in the form of publishers and dealers such as Paul Cassirer, J.B. Neumann, and Herwath Walden. 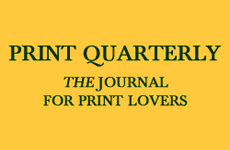 Print production became more “professional,” enhanced no doubt by access to the publishers’ capital, facilities and materials. After the war, the hyperinflation of the Weimar years offered a concrete motive for the accumulation of prints: they were a better store of monetary value than the worthless printed currency. The great social theorist and sour-puss Theodor Adorno saw this as a sell-out brought on by the machinations of capitalism, writing that “[w]hat is sociologically to be learned from the fate of the Expressionists is the primacy of the bourgeois profession over the need for expression…” As evidenced by the works in this exhibition, however, this process did not dilute the strength of the work, but fortified it (compare Kirchner’s hazy 1907 woodcut Three Women Conversing with his incisive 1919 masterpiece Winter Moonlit Night (Fig. 2), for example). 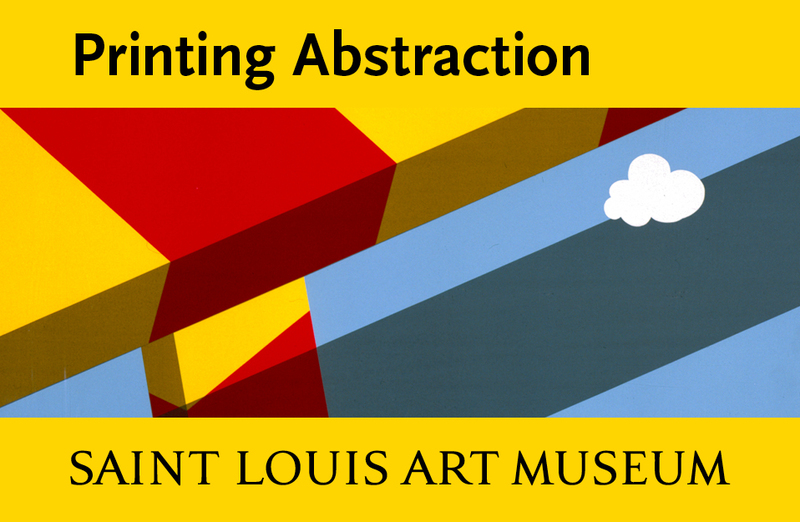 The expressionists’ printshops became some of the great forges of modernist art. Woodcut is commonly seen as emblematic of German Expressionism, but experiments with intaglio are this exhibition’s greatest revelation. 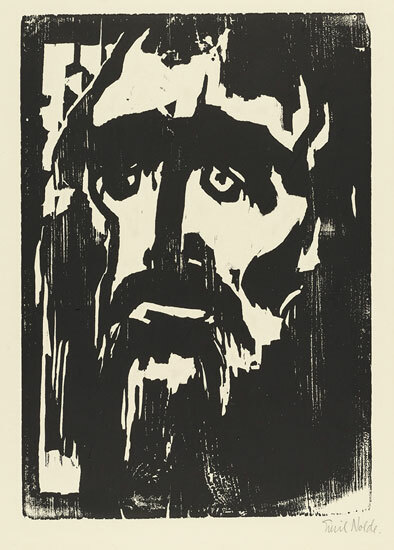 Emil Nolde’s woodblocks Prophet (1912; Fig. 3) and Head of a Woman III (1912) are famous exemplars of the (increasingly studied) primitivism of die Brücke, but his etchings of the Hamburg waterfront, Hamburg, Mild Atmosphere (1910), Hamburg, Pier (1910) and Steamer (large, dark) (1910) are more satisfying: the fineness of etched detail and tone that recreates brackish, undulating water broken up by vertical smoke stacks and moorings, piers, sooty skies and billowing clouds of steam, offer a subjective sensitivity quite unlike the chest-pounding of the other Brücke artists or the star-gazing of Blaue Reiter. These prints record an artist looking seriously outside his own head, and they ominously foreshadow the barren landscapes of the First World War. Fig. 4. Jeanne Mammen, Fasching in Berlin N III (Carnival in Berlin N III) (c.1930), watercolor and pencil on paper, 60 x 47.3 cm. The Museum of Modern Art, New York, gift of Mr. and Mrs. Richard Deutsch, 1977, ©2011 Jeanne Mammen, Artists Rights Society (ARS), New York/ VG Bild-Kunst Germany. That war, which thoroughly regimented and then nearly destroyed German society, gave Expressionism its keenest edge. This exhibition’s masterpiece is The War, Otto Dix’s 1924 portfolio of fifty drypoints, etchings and aquatints. As a draughtsman Dix had no parallel: the vibrant line sought so laboriously by his peers seems to have come effortlessly to him. His grotesque, cartoonish distortions of the human figure are little scenes from hell, drawn from memory. The obvious comparison is to Goya, and not only because of the subject matter: like The Disasters of War, Dix’s portfolio is a consummate exploration of intaglio techniques and their expressive capabilities. In Wounded Man Fleeing the combination of drypoint and etching on a white field gives the portrait a harrowing, feverish quality. Wounded Man Fleeing is composed with scratchy, frenetic lines, while aquatint is exploited for inky chiaroscuros of ghastliness in Flare Illuminates the Monacu-ferme and muddy, blood-sodden fields in Transporting the Wounded in Houthulst Forest. After looking closely at Dix’s rendering of war and its horrors, one wonders what all the fuss over Guernica was about. The death of innocence in the Great War is brutally evident in Weimar-era work. The anxiety that resonated harmlessly in pre-war works like Max Beckmann’s Night (1914) or Erich Heckel’s Driving Snow (1914) was replaced by full-on collective Post-Traumatic Stress Disorder. Dix and George Grosz ooze spleen and cynicism. 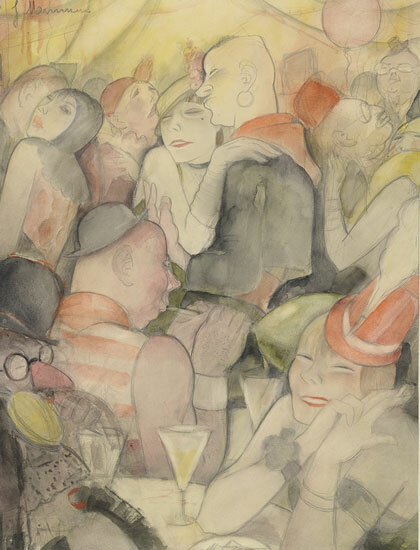 The depiction of Weimar nightlife in Jeanne Mammen’s drawing Carnival in Berlin III (1930;Fig. 4) is weirdly anachronistic, as if the crack epidemic hit during the Belle Époque. The woodblock prints of Käthe Kollwitz’ series War (1921–23), whose deep fields of black are so deliberate and so unlike the wild cutting in the pre-war prints, are almost unspeakably bleak. Kollwitz’ images are brought back from the abyss by a compassion that is largely absent in other artists, most of whom present the post-war denizens of Berlin as hopelessly contorted and wretched. Early die Brücke works sidestepped the Wagnerian urge to totality, presenting isolated nudes and dancers with very little context. 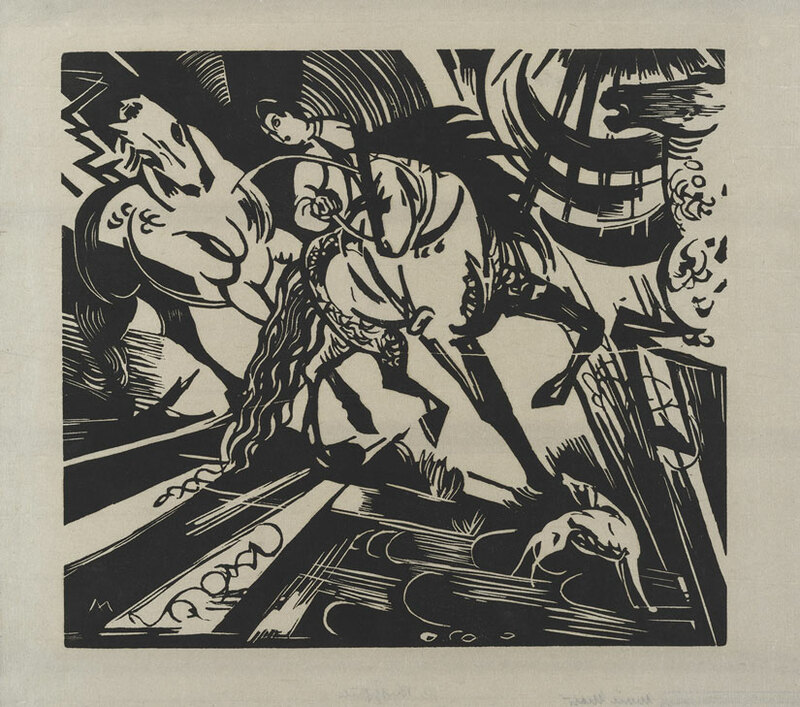 After the war, however, even small prints aspire to be tableaux of an entire society: in Beckmann’s lithographic series Hell (1919) the street scenes are so densely packed they almost burst from the picture plane, as if the artist was desperate to represent as much of his nightmarish era as possible. The fifty scenes of Dix’s The War strive to give the entire experience of that conflict. 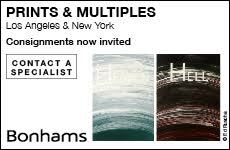 Today, socially conscious art is usually focused on very particular issues, so the noxious universality in this show comes as a shock. No respectable Weimar print collector could have possibly missed that he too was–at least in part–one of the fat little beasts being caricatured. Fig. 5. 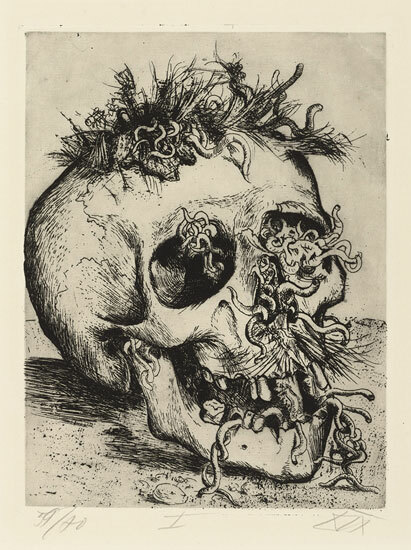 Otto Dix, Schädel (Skull) from the portfolio Der Krieg (The War) (1924), etching, plate 25.5 x 19.6 cm. The Museum of Modern Art, New York, gift of Abby Aldrich Rockefeller, 1934, ©Otto Dix/ 2010 Artists Rights Society (ARS), New York/ VG Bild-Kunst, Bonn. Expressionism’s desire to be radically true to subjective experience was obviously incompatible with the Nazi taste for sanitized romantic kitsch, but that very quality also threatens its contemporary relevance. In the 90 years since the last of these prints was completed, the world has become ever more fragmented and convoluted, and the increasingly subtle form of irony that is the currency of contemporary cultural life can only treat Expressionism as material for pastiche. We may be seduced by der Blaue Reiter artists’ earnest belief in the spiritual power of art, but we are also a little scornful. Any inspiration we take from Kandinsky’s theories on the metaphysical significance of colors we mute with a gentle condescension. The woolly spiritual agitation of die Brücke no longer rings true, nor do we share Weimar artists’ bilious disgust with society as a rotten whole. While few people would choose to live through the social, economic and military catastrophes that engendered this art, one cannot help but feel it would be nice to be able to believe in art the way these artists did (especially if it led to compositional breakthroughs like Kandinsky’s). But despite the enormous debt we owe to Expressionism, despite the visual punch it can still deliver, it may be that it is, to paraphrase Hegel, on the side of its highest possibilities, a thing of the past.